What is the Women's Streamside clinic? 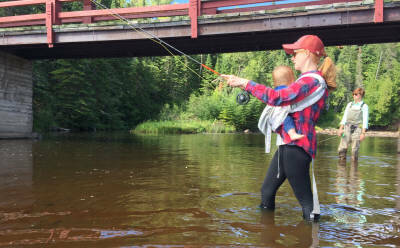 Minnesota Steelheader's Women on the Fly Streamside Clinic is a chance for novice and intermediate steelhead anglers to learn the fundamentals of fishing our North Shore streams and rivers. The clinic also provides ladies who are interested in steelheading but have limited experience, an opportunity to gain the perspective and knowledge needed to begin their own steelhead quest. This is an on the water clinic. Not only will you learn about the fishery, but you get some great guided fishing as well! You will be able to ask questions and get one-on-one time with our staff. The clinic also serves as a meet & greet for the women that fish the north shore and those who are interested in becoming "Women on the Fly". It's a great environment to meet and connect with other like-minded ladies. From sharing experiences to getting advice, women can learn a lot from one another! We review fishing equipment that is suitable for the techniques commonly used for steelheading: rods, reels, line, knots, flies/yarn, and misc extras. We give a brief summary on steelhead/Kamloops and the spring spawning run. We also go into detail on how to read water and provide some tips on safe river crossing. After some general overview our staff of male and female instructors will split the group and hit the water so each group will have some hands on instruction on locating fish, fly/yarn selection, and presentation. Note this is not a casting class but some assistance will be provided as needed . First and foremost bring a positive attitude. You will also need to supply yourself with a fishing license with trout stamp, your own fishing equipment (rod, real, line, flies, waders, rain gear, etc.). We also strongly suggest polarized glassed, a camera, water and snack. If you have questions on gear or equipment prior to the event, contact Lisa at: lisamae914@hotmail.com. We provide a nice handout detailing our fishery, what swims our waters, and the basic gear used. On top of this you receive hands on angling instruction and guiding by seasoned veterans. This clinic is open to all who are able to freely maneuver the root covered dirt and rock trails along the banks of the river. Most find the trails to be the easy part. It's the walking on rocks and light wading that requires a good sense of balance. Note too that we focus on entry level wading - no crazy deep water, most is less than knee high. We strongly encourage moms, sisters and daughters to participate in the clinic. Need an excuse for a girls fishing trip? Here it is! We limit this clinic to 12 anglers. So register early! Our volunteer staff is donating their time and talents to teach and guide during this wonderful clinic. All donations received for our events and clinics go right back to help fund future educational programs, community events and habitat projects, and further our conservation mission. This clinic continues on because of your generocity. Please note this is limited to only 12 anglers and registration fills up fast. get your spot reserved today! Please note this is limited to only 12 anglers and registration fills up fast. Please only register if you are 100% commited to attend. If you register after the limit has been met, you will be placed on the waiting list.